be the Queen of Clean! Give your kitchen the love it deserves with Maid Simple’s Kitchen Cleaner. Just a quick spray and a wipe removes grease and food splashes from kitchen worktops, shelving, sinks, taps and cupboards. Rinse off with a damp cloth. 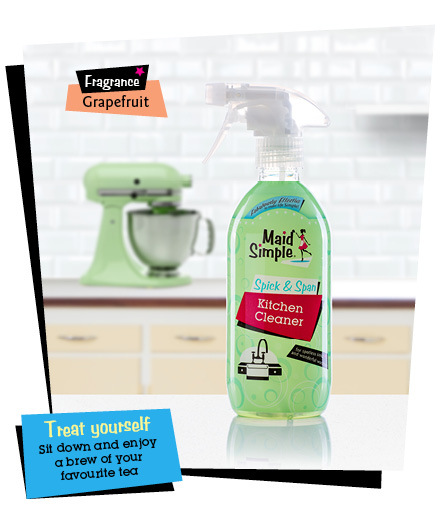 With a sassy grapefruit fragrance Maid Simple Kitchen Cleaner will have your culinary domain looking its best and smelling simply splendid before you know it! Maid Simple Laundry Soap is great for shifting stains from fabric. It can be used as a pre-treatment before a machine wash or just add to water for washing by hand. We have been amazed by the variety of stains this little 'power' bar can shift! Whilst it will work on stubborn stains on fabric it is still gentle enough to be used to hand wash laundry. It is great for traveling. More economical than liquids, more compact than powders it can be taken in hand luggage on aircraft. Maid Simple’s Stainless Steel Cleaner will help you to have a spotless kitchen in no time. Help your stainless steel to shimmer and shine with this easy-to-use product. Simply apply with a damp cloth then buff dry. Great for appliances, work surfaces, pots and pans cooker hoods, bins, draining boards and splash backs.